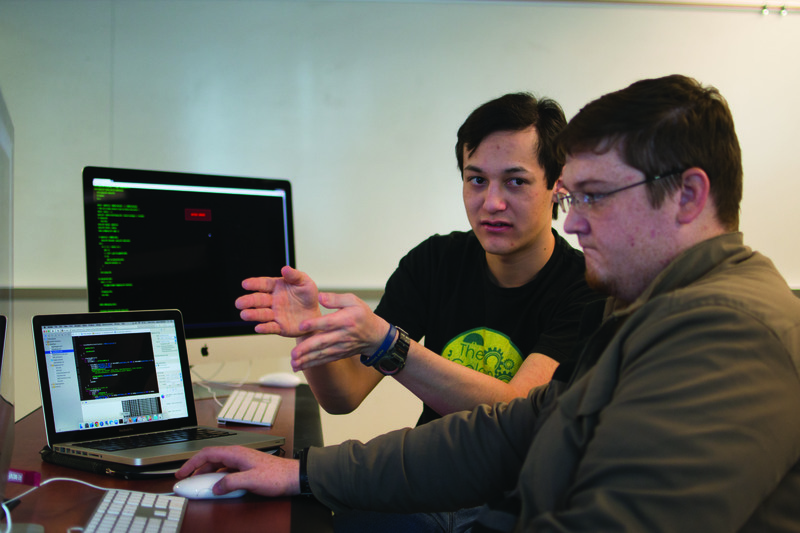 Balancing school, marriage and numerous jobs on the side can be a daunting task for some students, but Aaron Renfroe, sophomore software engineering major, is able to do it all and design his own smartphone applications. After taking the introductory course for application building at the Gordon and Jill Bourns College of Engineering at California Baptist University, Renfroe adjusted his scholastic route to pursue a new endeavor: creating software to his liking. Originally a mechanical engineering major when he transferred into CBU, Renfroe made the decision this past semester to pursue a path that he said was more rewarding to him after participating in a software engineering class taught by Dr. David Bishop, assistant professor of engineering and chair of the Computing Software and Data Sciences Department. Renfroe’s first gaming creation, and most time-consuming project thus far, has been ChApocalypse. In the game, players launch tennis balls at waves of chihuahuas with the tap of a finger and see how high they can score. The idea for the application came jokingly from the neighborhood dogs that live next door to Renfroe, but has since evolved into an iOS application that demands constant updates from its creator. Despite the simple gameplay, much of the coding and programming that goes on in the background of any of Renfroe’s applications often goes through many iterations and needs advice from a second set of eyes. This is where Christopher Chen, sophomore software engineering major and close friend stepped in. The bond and camaraderie the two partake in, also known as pair programming, is a major contributing factor into each other’s development as students and software designers. The pair programming is able to benefit both engineers, and as Chen said, whenever one of them is stuck at a certain stage of writing code, the other is able to provide a solution or helpful suggestion. For now, Renfroe continues to wear his many hats in addition to developing new applications as a form of software experimentation. With the addition of Apple’s new 3-D touch, Renfroe said there is more for him to discover and hopefully create in the upcoming weeks and months.